Large upright pianos are fairly heavy. The largest uprights have high backs with height reaching up to 60 inches and weight hitting 800+ lbs. The smallest grand piano start at 54 inches long and have an approximate of weight of 500 - 600 lbs. Grand pianos can range out to 110 inches long for a 9-foot concert grand piano it can weight approximately 1000-1200 lbs. Most of a piano's weight is due to the cast iron that holds the strings. Smaller upright pianos can weight 300-400lbs due to the fact they have smaller cast iron harps. Larger uprights range from 500lbs to well over 800lbs. Grand pianos range from 500lbs to well over 1,200lbs and can be fairly long at 4 /12 foot to over 6 foot. Due to this any large upright over 48" high or a grand piano over 6 foot long is not a DIY project. 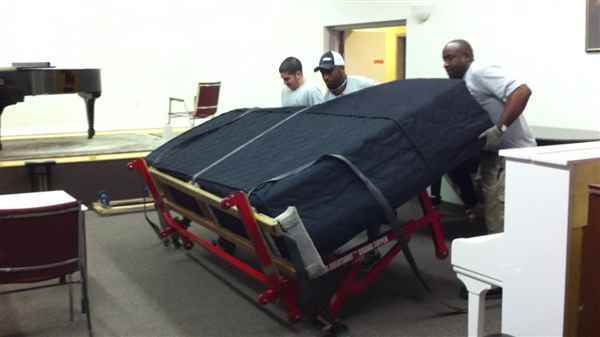 These larger pianos should always be moved by professional movers due to their extreme weight. Whenever a 4-wheel piano dolly can be used to transport the piano - muscle power on the part of the team to move it - the weight is minimized to almost zero. This is because all of the piano's weight is essentially supported by the dolly. A piano rightly balanced on a dolly is almost weightless and easily exceeds inertia on level surfaces. At Scranton Moving we use a dolly as much as possible. It is always the safest and easiest way to move a piano around. A dolly can be used to move a piano over even ground or on slight inclines and ramps or for tipping it up or down to get over a curb or a single step. The piano dolly is also used to move the piano over plywood or masonite to go across grass, gravel, sand, cobblestones, or any other slightly non even or loose surface. When moving this way though we always use at least 4 or 5 movers to push it and rotate the plywood or masonite. Let Scranton Moving move your piano. We originally started out 50 years ago as a piano mover, so we know piano moving. We use truck with hydraulic gates, piano dollies, and 4-5 man crews for the largest upright and grand pianos. So whether you need your piano moved within your house, across town, and transcontinental, please call us for all your piano moving needs.